AUGUST 12---An Ivy League visiting scholar was arrested Sunday by the FBI after he allegedly groped a sleeping woman’s breast and then tried to slide his hand down her shirt while traveling on a flight from Tokyo to Newark, New Jersey. Eun-jong Lee, 47, was detained by federal agents upon departing the United Airlines flight. He was subsequently charged with abusive sexual contact, a felony carrying a maximum two-year prison term and a $250,000 fine. According to a criminal complaint sworn by FBI Agent Mary Anne Flippo, Lee and the woman were seated next to each other on Flight 78. The woman, who was traveling alone, told agents she did not know Lee. 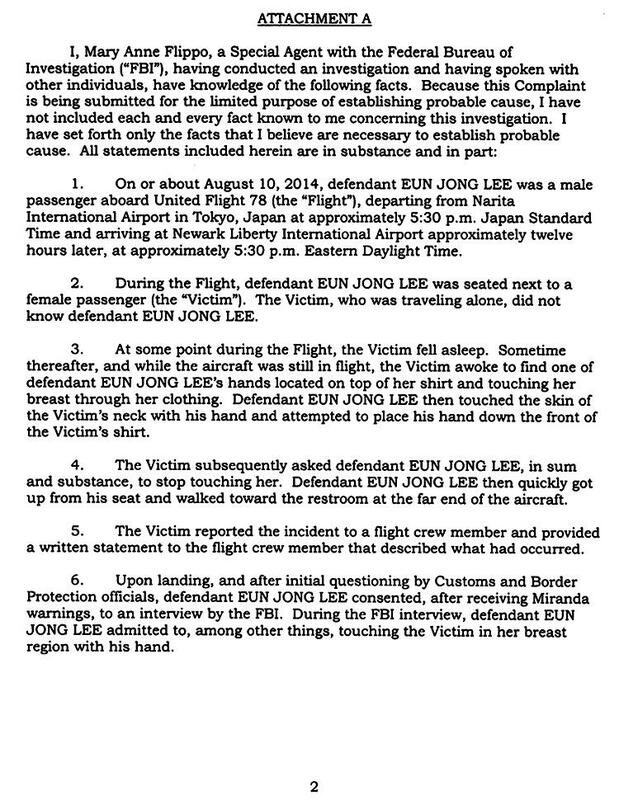 When the woman told Lee to stop touching her, he got up and walked to a restroom at the far end of the aircraft. The victim reported the incident to flight crew members, to whom she also provided a written statement. Pictured above, Lee is a professor at Handong Global University in South Korea. He is also a visiting scholar at Cornell University in Ithaca, New York, where he was headed prior to his arrest. Lee teaches in the College of Human Ecology’s Design & Environmental Analysis program.